Ferocactus peninsulae f. brevispinus hort. Ferocactus peninsulae f. brevispinus cristatus hort. 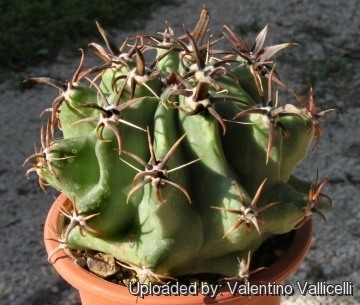 Ferocactus townsendianus var. santa-maria (Britton & Rose) G.E.Linds. 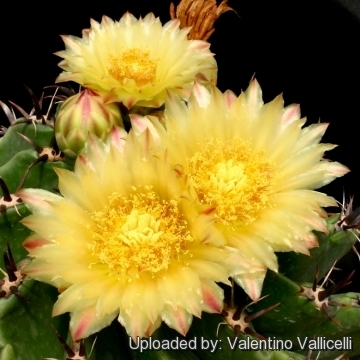 Description: Ferocactus peninsulae f. brevispinus is a solitary fast growing barrel ribbed cactus that differs from the type species in having a much shorter but stocky hooked central spine. This plant becomes very nice when a bit older. Stem: Round to elongated dark green 25-40 cm in diameter 40-100 tall and attaining exceptionally a height of 2,5 metres, which is unusual for the genus. 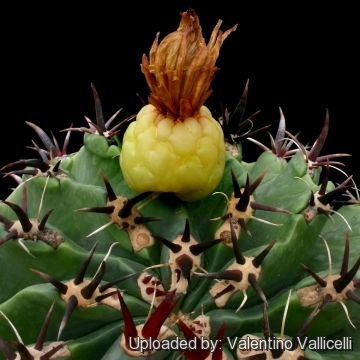 Ferocactus gracilis H.E.Gates: (subsp. gracilis) has stems up to 1 m in tall and has central spines less than 5 mm wide.Distribution: northern central Baja California. Ferocactus gracilis subs. coloratus (H.E.Gates) N.P.Taylor: Usually less than 1 m tall but the widest central spines often exceed 5 mm. Distribution: south of subspecies gracilis. 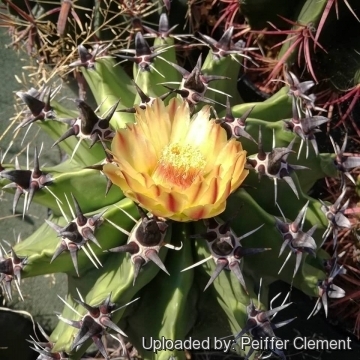 Ferocactus peninsulae (F.A.C.Weber) Britton & Rose: (subsp. peninsulae) has 4 central spines, forming a cross. Principal central spine flattened and strongly hooked, flowers over 5 cm long, outer periant segments spatulate. Plant somewhat allways taller than broad. Distribution: Baja California. Ferocactus peninsulae f. brevispinus (Chinned type): has very odd chinned ribs. Ferocactus peninsulae f. brevispinus cristatus hort. : Crested form. Ferocactus peninsulae f. brevispinus hort. : short spined form. Ferocactus peninsulae f. brevispinus cv. 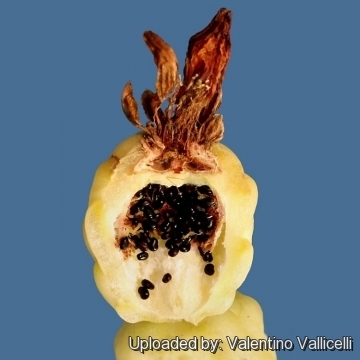 Artichoke: spineless form remembering in shape an Obregonia denegrii. 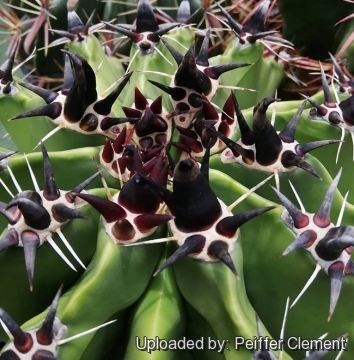 Ferocactus peninsulae subs. santa-maria (Britton & Rose) Pilbeam & Bowdery: has yellow flowers, principal central spine straight or slightly curved. Plant somewhat conical, taller than broad. Distribution: Southern Baja California. Ferocactus peninsulae subs. townsendianus (Britton & Rose) Pilbeam & Bowdery: has orange or red flowers, principal central spine strongly hooked. Plant somewhat conical, taller than broad. Distribution: Baja California (Magdalena Plain, Santa Margarita, Magdalena Islands). Ferocactus peninsulae subs. viscainensis (H.E.Gates) F.Wolf & R.Wolf: has 4 central spines, forming a cross. Plant to 1,5 m tall and 3 dm wide. Ribs 13-21. Distribution: Baja california norte. Cultivation and Propagation: It is a summer-growing and pretty easy species thought slow to start. It is suited for any rich, well drained soil such us clay, pumice, lava grit, and only a little peat or leaf-mould. If potted, repot preferably in the spring, if their roots become cramped. Generally, they should be repotted every other year in order to provide fresh soil. However, this doesn't necessarily mean they'll need larger containers. Fill about a quarter of the pot with broken crocks, gravel, etc. to promote good drainage. After repotting, do not water for a week or more. Water regularly during the aestival growth cycle (this plant need plenty of water, but do not overwater and let their soil dry out between waterings), and also needs to be avoided wetting the body of this plant while it is in sunlight. 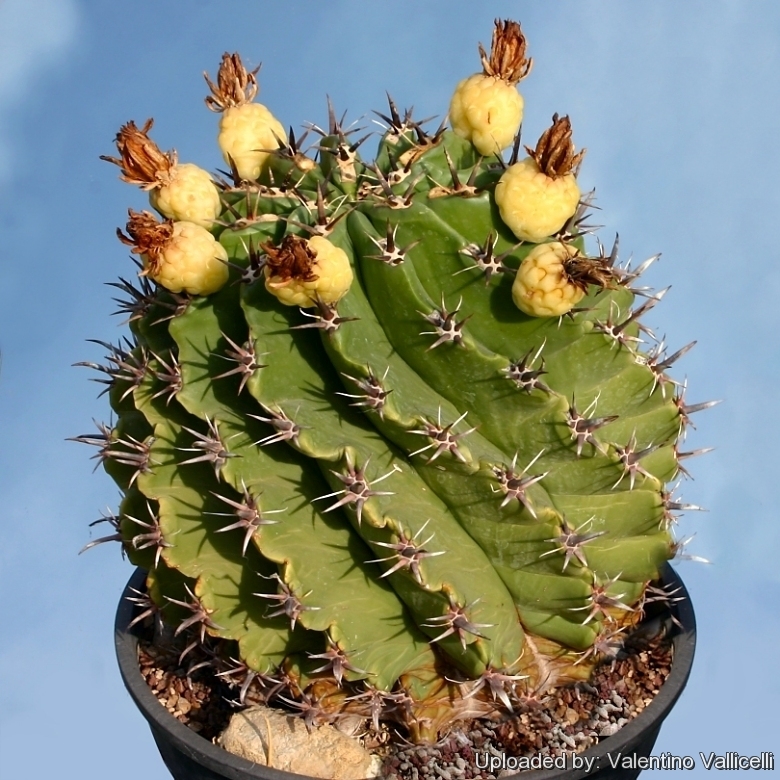 A wet cactus in the sun light can cause sun burning which can lead to scars or even fungal infections and death, keep rather dry in winter. No water should ever be allowed to stand around the roots. Feed with a high potassium fertilizer in summer.